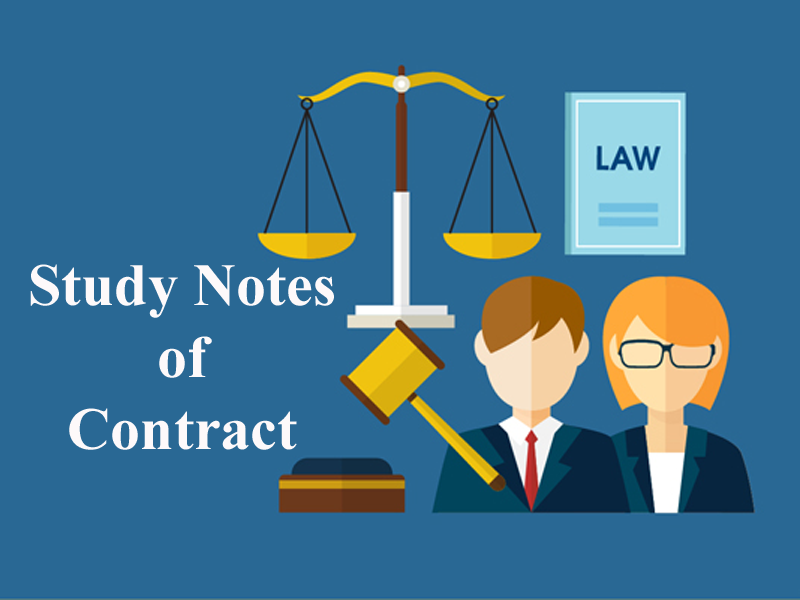 Here we are providing you updated and most relevant Study notes on Contract of Free Consent for Law Entrance Exam. These study notes are highly recommendable for all those who aspire to crack CLAT, DULLB, AILET and other Law Entrance Exam. Section 13: Two or more persons are said to consent when they agree upon the same thing in the same sense. One of the essentials of a valid contract mentioned in section 10 is that the parties should enter into the contract with their free consent. Coercion: Coercion is said to the when the consent of the person has been caused either by committing or threatening to commit any act for hidden by law. Example: A threatens to shoot B if B does not agree to sell his property to ‘A’ at a stated price. B’s consent, in this case, has been obtained by coercion. A widow was forced to adopt a boy before cremation of her husband. The relatives did not allow the cremation until the widow agreed to adopt the child. The high court held such adoption is not valid as the consent was attained by coercion. Effect of Coercion: A Contract brought about by coercion is voidable at the option of the party whose consent was obtained by coercion. Note: Threat To Commit Suicide Amount Coercion. The Madras High Court answered the question in the affirmative, holding that a threat to commit suicide does amount to coercion. In that case, a person, by a threat to commit suicide, induced his wife and son to execute a release deed in favour of his brother in respect of certain properties, which they claimed as their own. The transaction was set aside on the grounds of coercion. A contract is said to be induced by undue influence where the relation subsisting between the parties are such that one of the parties is in a position to dominate the will of the other. He uses the position to obtain the unfair advantage on other. (a) Where he holds a real or apparent authority over the other, e.g., the relationship between master and the servant, police officer and the accused; etc. (c) Where he makes a contract with a person whose mental capacity is temporarily or permanently affected by reason of age, illness, or mental or bodily distress, e.g., old illiterate persons. In all these above-mentioned situations, a law would presume that the contract has been procured by undue influence and burden of rebutting the same will fall on the other party. A spiritual advisor told his disciple that if the latter gives away all his properties to the Guru, he would attain “Mukti”. The disciple, accordingly made out a release deed. Later, he sought to set it aside and the Court held that the contract was affected by undue influence. Effect of Undue Influence: When consent to an agreement is caused by undue influence, the agreement is a contract voidable at the option of the aggrieved party. Fraud is defined as an act of a party to deceiving the other. 1. The suggestion, so to a fact, of that which is not true by one who does not believe it to be true. Example: P sells to Q a chain representing it to be a gold chain, while it is actually not. It amounts to fraud. 2. The active concealment of a fact by one having knowledge or belief of the fact. Example: X, a furniture dealer, conceals the crack in the furniture and sells it to Y. This would amount to fraud through active concealment. 3. A promise made without any intention of performing it. Example: A man purchased some goods on credit knowing fully well that he will not be able to pay for it. 4. Any other act was done to conceal. 5. Any such act or omission as the law specially declares to be fraudulent. Example: Under the Transfer of Property Act, if a seller fails to reveal to the buyer any material defect of which he is aware, it amounts to fraud. According to Anson “Misrepresentation is a false statement which the person making it honestly believes it to be true, which he does not know to the false, it will include won non-disclosure of facts without any intention to deceive any party”. A representation when wrongly made, though innocently is termed as misrepresentation. Example: A sells a camera to B, genuinely believing it to be of China make. However, it turns out to be of Nepal make. The buyer gets the right to cancel the contract, as B’s consent has been affected by misrepresentation. Note: In the above example, had An intentionally made the statement, it would have turned out to be a case of fraud. In both cases, the representation made is untrue. However, in the case of fraud, the intention to cheat is willful, whereas, in the case of misrepresentation, the wrong statement is made innocently without any willful intention. In both cases, the contract becomes voidable and the aggrieved party may set it aside. However, in the case of fraud, which is also a civil wrong the aggrieved party may file a suit for damages, in addition to rescinding the contract. Can silence amount to Fraud? Generally, silence as to facts is not fraud. However, where there is a duty to speak and the person keeps silence, it is fraud. Following are cases where silence is fraudulent: Contracts “Uberrimae fidei” [Contracts requiring utmost good faith] these are contracts where one party has peculiar means of knowledge, which is not accessible to the other. iv. Contract of family settlement. The prospectus of a company did not refer to the existence of a document disclosing liabilities. This gave the impression that the company was prosperous. If the existence of the liability had been disclosed, the impression would have been quite different. Held, non-disclosure amounted to fraud and anyone who purchased shares on the faith of the prospectus could avoid the contract. It may be defined as a wrong belief about something. The following classification will be useful in understanding how it is dealt with under Contract Act. (i) Mistake of Law: “Ignorance of the law is no excuse” is the maxim, which applies in this context. Thus, if a party makes a mistake of law and wants to avoid the contract on this ground, it is not viable and no relief can be granted. (ii) The mistake of Foreign Law: This stands on the same footing as that of mistake of fact. Hence, mistake of foreign law makes the agreement void. (iii) Unilateral Mistake: When only one party to a contract, makes a mistake, regarding facts related to the contract, it is termed unilateral mistake. Example: Akash signs a sale deed for a sum of Rs.8000/-. Later on, he cannot avoid the sale by stating that he had signed the deed thinking that the sale consideration was for Rs. 10000/-. This is a unilateral mistake and the effect of such a mistake shall not render a contract void or voidable. The contract is valid. NOTE: Thus, when only one party to the contract makes a mistake, the contract is valid. However, under certain circumstances, a unilateral mistake shall render a contract void or voidable. Exception No. 1 Circumstance under which unilateral mistake renders a contract voidable: When a party to the contract obtains the consent of the other party, by fraudulent means. Example: Satish sells a house to Ramesh, representing that it is in good condition, and free from defects. Actually, the building had developed quite a few cracks, which were cleverly concealed by Satish by sealing and painting them. In this case, if Ramesh buys the house, believing that the building is in good condition, he can later on the set aside the contract, if he learns the truth at a later date. (a) Mistake as to Nature of Transaction: When there is a mistake, touching the very root or nature of the Contract, it is said to be a mistake with regard to nature of the Contract. A blind man was induced to sign a bill of exchange. It was represented to him that it was only a guarantee. Held, the blind man was not liable on the bill of exchange. The court observed that the document was void, as his mind did not accompany his signature. (b) Mistake as to the Identity of Party Contracted with: When one party, let us say A, makes an agreement with C, thinking him to be B, this agreement is not valid because there is a mistake with regard to the identity of persons. To understand this point, a study of the following case laws will be very useful. One Belkaran imitating the signature of Belkiran induced Lindsay to supply goods to him. Belkaran. sold the goods to Cundy, who paid for them. Lindsay sued Cundy for the recovery of the goods. The court held Lindsay could recover the goods from Cundy. This was not the mere case of fraud. This was a case of the mistake as to the identity of party contracted with. The court observed as follows “of him, he never thought”. “About him, he never knew”. “With him, he never intended to deal”. So, there was no contract, in the first, place between Lindsay and Belkaran. In the absence of a contract, Belkaran. could not have passed any title to Cundy. With the result, the Court held that Lindsay could recover the goods from Cundy. A man called North entered a jeweller’s shop and selected some jewels. When he took out his chequebook, the shopkeeper asked him to identify himself. North identified himself as Sir George Bullough. North signed the cheque as Sir George Bullough. North pledged the jewels with a pawnbroker. The cheque was dishonoured. The shopkeeper sought to recover the jewels from the pawnbroker. Held, the shopkeeper could not recover. The shopkeeper did not make any mistake as to the identity of the party contracted with him. He only entered the contract with the person who appeared before him. Note: This is a case of fraud and no mistake as to the identity of person contracted with. A customer enquired the prices of rifles and said he might need about 50 numbers. Later he sent a telegram with the words “send three rifles”. But the telegraph clerk transmitted the message as “send the rifles”. The seller, recalling the earlier remark of the buyer, sent 50 rifles. The buyer accepted three of them and returned the remaining ones. The seller filed a suit against the buyer to recover the prices of remaining rifles. Held that there was the bilateral mistake, hence the contract relating to 47 rifles was declared void. Example: X agrees to buy a particular horse from Y. Both believe it is a racehorse, but it turns out to be a cart horse. The agreement is void because there is a bilateral mistake as to the quality of the subject matter. Under very rare circumstances a person agrees to purchase some goods which unknown to him and the seller is his own already. This agreement is void ab-initio. Example: An agreed to take a lease of the fishery from B, though contrary to the belief of both parties at the time A was the tenant for life by inheritance of the fishery and B had no title at all. It was held that the lease agreement was void. Where both parties are working under a mistake as to the identity of the subject matter i.e. one party had one thing in mind and the other party had another, the agreement is void for lack of identity of minds of both parties. 4. Free consent has been defined under which Sec. 8. Coercion has been defined under which Sec. 9. Does threat to suicide fall under coercion? 10. Consent obtained through coercion is? 14. A spiritual advisor told his disciple that if the latter gives away all his properties to the Guru, he would attain “Mukti”. This falls under Undue influence. 15. Consent obtained through undue influence is? 16. Fraud has been defined under which Sec. of The Indian Contract Act? 17. A contract with X whose is a member of a country declared to be of enemy character. Is he competent to contract? 21. Consent obtained through fraud is? 23. Misrepresentation is mentioned in which Sec of The Indian Contract Act? 31. Where both parties are under mistake of fact the agreement becomes void. This is given in which Sec. of The Indian Contract Act? 32. Sec. 21 of The Indian Contract Act deals with? Get the updated and most relevant study notes on Contract of Free Consent for upcoming CLAT and other Law Entrance Examination.